When you need heating repair in Columbus, you need to act quickly to resolve the problem, since our winters aren’t forgiving enough to leave you without heat for any significant length of time. Trained technicians learn to pinpoint the source of the breakdown quickly and get your heater up and running again before you have to resort to huddling in a blanket to stay warm. The pilot light is a common spot for heating problems, and often one of the first places a service technician will check. Here’s a rundown of why the pilot light won’t stay lit. The purpose of the pilot light is to ignite the gas that heats the air in your furnace. When it goes out, the gas won’t light and the heater won’t work. In some cases, a pilot light can get blown out by a draft or a gust of wind. It’s easy enough to re-ignite it, though you may want to talk to a professional about moving the furnace (or addressing the draft) if the problem persists. A pilot light can also flicker intermittently or go out entirely if it has a high build-up of carbon on the tip. It’s an easy problem to correct, though a professional is probably required, since he knows how to remove the build-up without damaging the light itself. A more seriously problem will emerge if the thermocouple is damaged. This component often sits very close to the pilot light (it may be a part of the same component in some models) and regulates the flow of gas into the burners. If the pilot light is off, it shuts off the gas as a safety measure. Similarly, if the thermocouple is damaged, the pilot light itself will shut off to prevent any accidents. The thermocouple will need to be repaired or replace if the unit is to continue functioning. If your pilot light won’t stay lit, then call on Quality Air Heating and Air Conditioning to help. 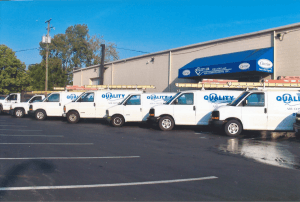 We handle all kinds of heating repair in Columbus, from faulty pilot lights to full-bore installation and replacement services. Contact us today to set up an appointment.